Sometimes it feels like a waste to use foodstuffs for non food purposes. Like an avocado face mask, a cucumber eye treatment, or a tea rinse for your hair. 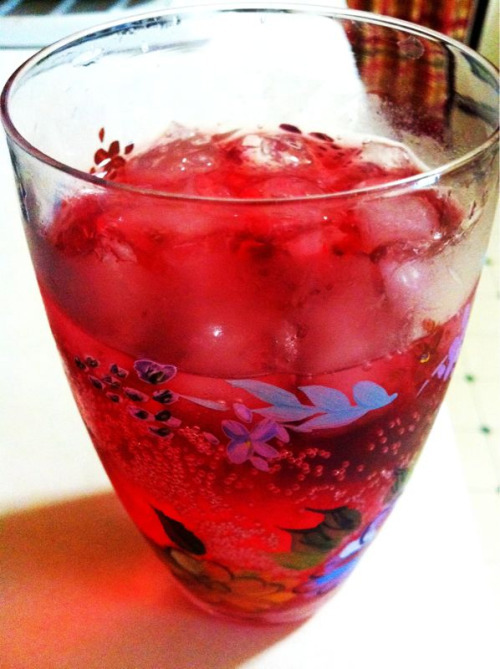 Still, the hibiscus tea rinse I’m going to talk about is worth a small guilty feeling. It’s also a great way to use up hibiscus tea that’s gone cold in the tea pot, or has steeped too long. And in that case, no need for guilt! What Can Hibiscus Tea Do for Your Hair? As you know if you’ve ever made hibiscus tea, the tea itself is a ruby-red, and it leaves stains if you happen to spill any. It can also leave red color in your hair — if your hair is light enough, and if the hibiscus tea you use for the rinse is strong enough. It’s not like a regular hair dye; don’t expect the kind of spectacular, long-lasting results you would get from unadulterated henna. After you wash your hair a couple of times, the hibiscus stain will go away. But then, that’s also the charm of this rinse. You can try it out without worrying that it will actually dye your hair without any way to remove the color, the way henna does. Several dark-haired people on the Long Hair Forum who have tried a hibiscus tea rinse have reported that it didn’t add color to their hair at all. Instead, the tea gave their hair extra softness and shine, the kind you get from a really good conditioner. So it’s worth trying, just for that, I think. Make hibiscus tea from tea bags or loose tea leaves, following this recipe. Do not remove the tea bags or tea infuser from the tea! Instead, let the tea steep for a much longer time, at least 1 hour, but you can leave it as long as 24 hours. It won’t spoil. Take out the tea bags or leaves, and pour the tea into a glass container that’s easy to pour from. Don’t use plastic, or it will stain! When you take a shower, wash your hair with your usual shampoo and conditioner. Then pour the hibiscus tea rinse over your hair. Leave the hibiscus rinse in your hair and let it dry naturally. If you try this herbal rinse, please let me know in the comments or via email how it works out for you! I’d love to add some photos and make a ‘before and after’ series.